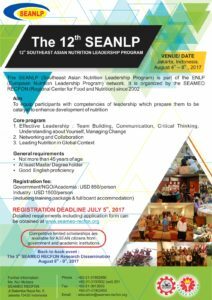 From 4 to 8 August 2017, the Southeast Asian Ministers of Education Organization Regional Center for Food and Nutrition (SEAMEO RECFON) hosted the 12th Southeast Asian Nutrition Leadership Program (SEANLP) in Indonesia. The SEANLP is part of the European Nutrition Leadership Program network and was organised to prepare nutrition champions in the region to be catalysts for change in scaling up nutrition. The SEANLP has been organized by SEAMEO RECFON since 2002 to provide a forum for networking among nutritionists in the region where information and ideas are exchanged and collaboration projects can be established.